COLUMBUS, Ohio – After a tumultuous 15 days on the picket line, teachers in the conservative community of Reynoldsburg, near Columbus, Ohio, went back to work with a solid settlement this past week. 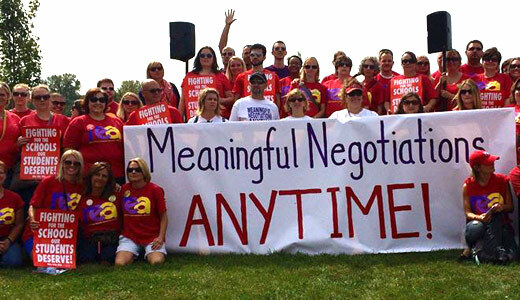 Like all labor contracts, the settlement is somewhat of a compromise, but it is actually a major victory not only for the 374 teachers represented by the Reynoldsburg Education Association (REA), but for the students, parents and community in general. Teachers, as well as parents, students and the wider community, saw the strike as a foregone conclusion, one that was forced onto the teachers. “The vast majority of teachers felt we did the right thing, both for ourselves and our families, but for our students and for education in Reynoldsburg,” stated REA spokesperson Kathy Evans. The settlement will protect teacher’s health care and pensions and establishes, for the first time, a program to control the growth of class sizes. Teachers are to get raises of 2 percent the first year, 1.6 percent and 1.9 percent in succeeding years. Board proposals to forego contractual increases for so-called merit pay are nowhere in the new contract. For weeks prior to the contract deadline, the Reynoldsburg School Board, representing extreme “tea party” views, used the GOP-leaning media in Columbus to attack teacher’s competency, commitment and push their program of establishing a “merit pay” based system. The board’s program included wiping out teacher’s paid health care and replacing it with lump sum payments, as well as attacks on the teacher’s pensions. The entire pay system was to be overturned, if the board had its way, replaced entirely with a system of subjectively run “merit pay” and lump sums. Teacher and parent/community input into education in Reynoldsburg was to be sidelined, replaced completely with a corporate-run system, based exclusively on testing. The teachers, on the other hand, took a strong position for limiting classroom size, for longer, structured programs of class preparation, as well as standing up for parent and community input into education. The system of structured pay raises, health care and pensions were strongly defended by the REA, and student’s welfare was a high priority. These stands hit a strong positive note for the entire Reynoldsburg community. Treating the strike as a militarized threat, the school board advertised across Ohio to bring in scabs to teach & spent over $80,000 bringing in the union-busting firm, Huffmaster. They used radio and the press to issue public threats to arrest students or parents supporting the teachers. Superintendent Tina Thomas-Manning defended the use of scabs and union-busters during the walkout, stating they were for “the safety of the students.” Her pay, however, had become a major issue, both for teachers and parents prior to & during the strike. 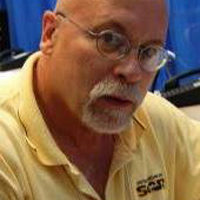 The school board had raised the pay of the previous superintendent, Steve Dacklin, by 20.8 percent in 2011, and again raised pay for that position by 8.5 percent when Thomas-Manning was hired, with no prior experience in this position, in January of this year. Parents and community folks also weighed in. A large community organization, ‘Families for Teachers,’ called a Community Education Rally in front of the Reynoldsburg High School. Estimated at over a thousand folks, the event set a tone of massive community support for the embattled teachers. Throughout the two-week strike, it was difficult to be heard on the picket lines over the noise of almost constant horns honking in support of the teachers. Regularly, a car would swing over to the line and unload food, drinks or even lawn chairs, newspapers to show articles supporting the teachers to picketers. Parents and students were a constant presence on the picket line, defying the board’s threats. 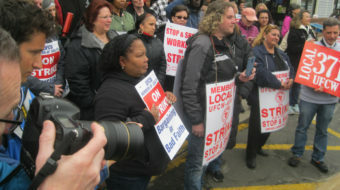 Teachers from other districts, union members and retirees also organized daily solidarity rallies. Candidates for office also made appearances on the teacher’s lines. Mike Schadek and Marilyn Brown, Democrats running for Auditor and Commissioner, respectively, came to support the teachers. Both Ed Fitzgerald and Nina Turner, Democrats running for Ohio Governor and Secretary of State, issued statements of support. None of the Republicans supported the teachers. The board’s plan to use the conservative media to attack teachers then took a big hit when the REA pushed to bring in a federal mediator, who issued a “gag order” to both parties. With their opponents denied a platform for attacks on teachers and public education, and forced instead to actually negotiate, the teachers were able to gain a decent proposal to take to their members, who voted overwhelmingly to approve it, ending the strike. The Reynoldsburg teacher’s strike actually provided a tremendous education for not only the teachers, but the students, parents, community and labor movement of Central Ohio. The community saw that, if they wanted to preserve quality education for their children and maintain a fair community, they had to stand up and get involved, stand up with their embattled teachers. The whole labor movement took up this fight, as its own, understanding that if they busted the teachers, it would harm all working folks. The teachers stood up, fighting for justice, not just for themselves, but found new ways to build solidarity with their students, the parents, the entire community and labor. The students, as well, got the education of a lifetime, the chance to stand up and fight for justice, with their teachers, their friends and neighbors. Even the Reynoldsburg School Board got an education. Theirs, however, was of a much different sort. We’ll have to wait and see if it takes.